"This may come as a shock to people struggling to sell their homes in the Denver area, as well as Realtors listing homes, but in May, homes on average sold faster in Denver than any place in the nation, according to an analysis of 146 metropolitan areas tracked by Realtor.com. May marked the second consecutive month that Denver had the boasting rights as the No. 1 metropolitan area for home sales speed in the country, according to Realtor.com, which is owned by the National Association of Realtors. The Realtor.com report shows that it took only an average of 39 days to sell a home in the Denver area in May. That is 11.4 percent faster than the 44 days it took in April." 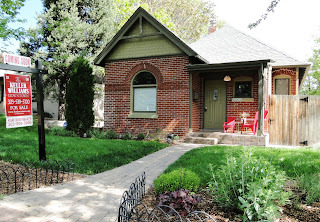 Adorable NW Denver Bungalow- Near Highlands Square & Sloans Lake! Features Include Large Master w/Two Closets, Lots Of Living Space, Over-sized Three Car Garage + 1 Off-Street Space, And Fabulous Outdoor Space.